– Franklin County, MA area planning meeting: Monday, 4/9, 2-4 p.m. in Greenfield Room at Greenfield Public Library, 402 Main Street. Enter through library’s rear door. Contact Ruth if you plan to come or if you have questions. 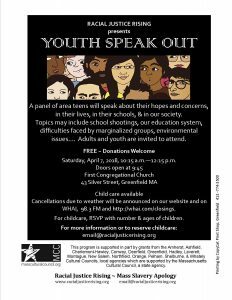 A panel of a­­rea teens will talk about their hopes and concerns, in their lives, in their schools, & in our society. Topics may include school shootings, our education system, difficulties faced by marginalized groups, environmental issues…. Open to the public. Youth and educators especially welcome. Help wanted – Seeking a volunteer to help out with our sound system and projector at our monthly Saturday morning programs. Contact us to learn more… or come to our next program and say hi! The weather is finally better – please join us! 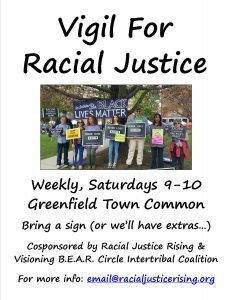 Saturday May 6, Greenfield MA: All Souls Church’s Annual Antiracism Film Festival, 399 Main Street. Free, with childcare. Facilitated discussions following each film. June 8-10, Northampton MA: Undoing Racism Workshop with the People’s Institute for Survival and Beyond, organized by UROC of Western MA. Thank you, readers who send us information for these newsletters! – We welcome links to articles, videos, event listings, and other resources. And we welcome your feedback!